RETool – PrimeCode/RMS Connector | Nexbridge Inc. RETool by Nexbridge substantially improves developer productivity by integrating PrimeCode/RMS into ECLIPSE. Until now, developers had to use either external interfaces or FTP files to a NonStop server and then interact with PrimeCode. 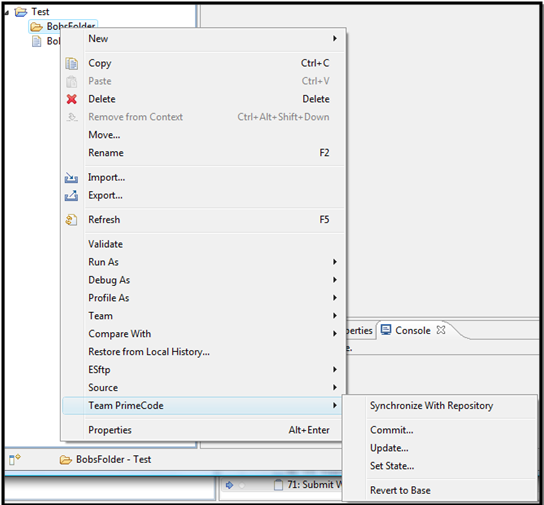 With RETool, developers can use PrimeCode directly from their ECLIPSE workbench through simple pop-up menus. The RETool Type 2 provider supports normal developer functions, including commit, update, synchronize, and history. Type 2 can act completely standalone and does not require another Team provider. RETool leverages the ECLIPSE Team and Synchronization Workbench Frameworks to provide cost-effective integration with the Emperex PrimeCode product. Developers are just a few mouse clicks away from most interactions with development RMS catalogs. Like other ECLIPSE plug-ins, RETool updates are deployed using the ECLIPSE Update Manager, making management of RETool itself very simple. On the host, RETool integrates into the SSH to start up individual sessions. RETool uses standard NSK security mechanisms, so PrimeCode does not have to be aware of RETool. The key benefits of RETool to the developer are simplicity, speed, and general increased acceptance of PrimeCode. Developers who are new to the PrimeCode space will be more comfortable using RETool, since it requires no special NonStop knowledge. In fact, if coupled with the Corona cross compilation plug-in and HP cross compilers, the only time developers will need to interact with the NonStop is to platform-test their code. RETool supports extended RMS component names, so developers will be able to use case-sensitive workstation-like names rather than Guardian names, making Java and C++ development substantially easier. Commit RETool has the ability to perform complete submit functions on projects, groups, and files. The submit operation supports comments and user change identifiers. Update RETool can extract entire projects, groups, and individual files to quickly obtain the correct versions of code from the catalog. Synchronize Developers can use RETool to easily perform up-to-date checks to determine what has changed in the repository compared with the software in their workspaces. Changes can be added and merged into work-in-progress. Merge RETool leverages the Synchronize capability to allow developers to efficiently and graphically merge changes between branches and local changes. Developers no longer have to sign-on to TACL to run RMSMERGE. History RETool can also provide history information on what has changed in a component, throughout its lifespan. Produce Once changes are checked in, developers can initiate produce commands from RETool and capture output on their workstations, without ever leaving ECLIPSE. Promote As of 2.0, RETool added promote and demote capabilities to move state markers on component versions. Add/Delete With 3.0, Components are automatically added and removed from catalogs to reflect workstation contents during Commit operations. SSH2 Connections are now using SSH software is available on NonStop servers. No information is sent over the wire or wireless without being encrypted, including file transfers. RETool has other capabilities as well. Make sure you discuss these with your Nexbridge representative. The above screen capture shows a sample of what the RETool Type 2 plug-in looks like to a user. Developers can commit or update entire projects, specific folders, or individual files with just a few clicks, while staying in ECLIPSE. All of the RETool product types support multiple repositories. 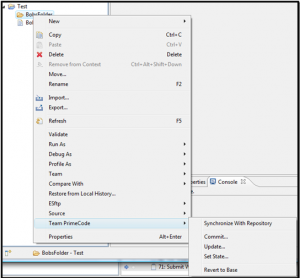 Individual projects within an ECLIPSE workspace can be associated with a separate RMS catalog. This allows complex workspaces to be constructed, potentially with projects hosted on different NonStop servers or even with different ECLIPSE Team providers. The RETool Type 2 product even allows one team provider to host the project, while supporting commit and update functions to a different RMS catalog. For example, developers could do their day-to-day work in Git, Mercurial, Subversion, or CVS, and commit code to PrimeCode only when ready for integration testing. RETool Type 2 facilitates this development process. Because RETool uses the RMS Subsystem Programmatic Interface (SPI), it is actually independent of the version of the RMSMON process running on the NonStop. System managers can upgrade RMSMON without needing to upgrade RETool at the same time. In fact, because RETool can function with different versions of RMSMON, it is highly friendly to a diverse environment, where different groups operate different copies of PrimeCode, but share resources and components. Note that SPIBridge™ is a required component. 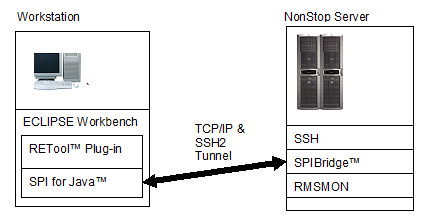 RETool communicates with RMSMON using the SPIBridge™ client and server using SPI for Java™. Clients can communicate with multiple PrimeCode Repositories/Catalogs, even within one workspace. Projects can be configured with different states allowing developers to switch between development and support roles instantly. Support for any workstation type and operating system supporting ECLIPSE Helios or above. Platform independent client plug-in with all Java interfaces, without the need for JNI or native code. Please contact your Nexbridge sales representative to find out more about the RETool by Nexbridge product. Corporate licenses and volume discounts are available. Annual license fees per seat and per host apply. All information is subject to change.